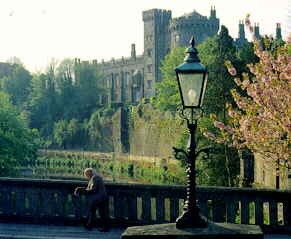 Kilkenny is one of the most colourful cities of Ireland. 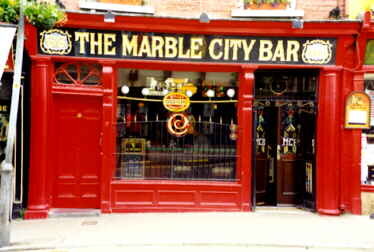 And in Ireland, cities are very colourful. Usually you will find a pallet of yellow, blue, red, green, pink and purple on the shops and houses. 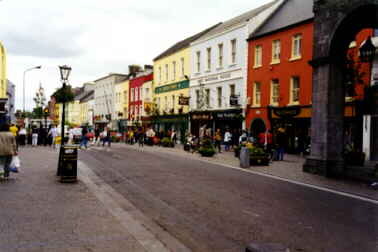 But Kilkenny is very colourful. A pub like this really invites to come and have a pint of Guinness (or Smithwicks, for those who prefer the locally brewed stuff). You can visit the brewery, although you mainly see a video according to the guidebooks. The brewery is not hard to find. Just follow your nose, as it is to be smelled throughout the (colourful) city. 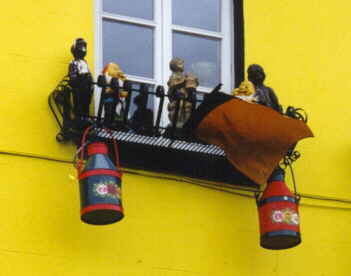 Several places make use of gnomes and other attributes to make an even more inviting and colourful picture. 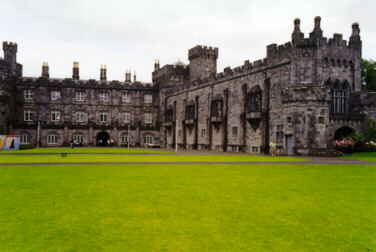 Apart from a nice (and colourful) place, Kilkenny offers a castle as well. The castle is restored in the grandeur of the nineteenth century. Because you are not allowed to make pictures of the inside (paintings, carpets, very colourful silk wallpaper and so on), you expect them to sell lots of postcards. But they didn't take pictures themselves either. At least, they do not discriminate. But how should you fill your homepage then?